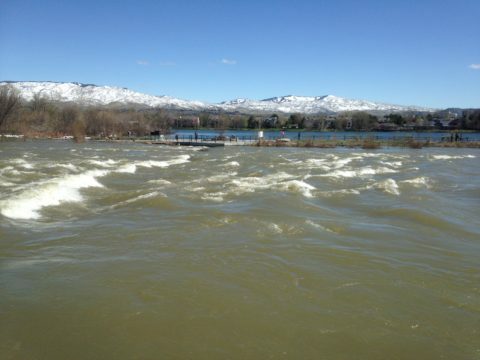 As some of you may know, the Boise River is running very high this spring. We live only a block from the river, and Hubby and I have been watching the water rising, wondering if it’ll get to us. The three reservoirs above us are not quite full, but there’s enough snowpack above them that they could be filled six times over. All that water has to go somewhere, and in this case, a lot of it will be going past our neighborhood. Our favorite walking routes are getting shorter because they’re being closed due to flooding. Our beloved greenbelt has water all over it. Some of our favorite biking parts of it are washing away so it will be some time before they get repairs done. We bought our place knowing that flooding could occur. The city and USGS floodplain maps show that we live outside the floodplain. That’s all well and good, but what concerns us the most are Mother Nature’s map of her floodplains. She has the final word on exactly where her water will go. For that reason, we got flood insurance from the first day we owned this house ten years ago. I hope we don’t ever have to use it, but I’m glad it’s there for us if we do. We had a record breaking winter with snowfall. Last week, the ski area just north of town got a foot of new snow. That’s just more snowmelt coming our way. At the same time, we had a record-breaking rainfall total for one day in Boise. Places in town were flooded from the rain. It gets old after a while. There are other places in town lower than we are, and some of them are very expensive homes. On the news the other night, they interviewed a man who owns one of those expensive homes. He said he was thinking about getting flood insurance and hoped the river wouldn’t rise any more for the next 30 days. It takes that long for the insurance to start. I’m wondering what he was thinking when it was snowing heavily all winter long. Snow in the hills comes down sooner or later in the form of high flows in streams and river. That’s Mother Nature for you. Speaking of coming down, lots of boulders and dirt is coming down along some of these highways. I don’t think we’ll be traveling north into the mountains until things dry out. Too many things rolling down on the roads makes me very uncomfortable. Don’t worry about Hubby and me. We’ve got a plan in case water reaches our house. We’ll be fine. We hope Mother Nature will be kind to Boise and give us a cool spring so all that snowmelt doesn’t come down at once.